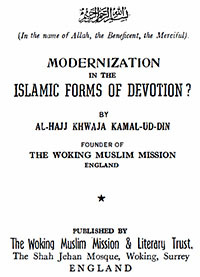 In this book, Khwaja Kamal-ud-Din explains how Prayer (Salat) in Islam modernises the human expression of devotion to the Higher Being (Allah). Fortunately for us Muslims, we receive our inspiration from a Book which is admittedly the same today as it was when delivered to us by the Founder, of our Faith. We have accepted it as the Last Word of God, and we believe that every word of it comes directly from Him. It is not the work of Muhammad (peace and blessings of Allah be upon him), nor has the purport of its message been translated into any words of his. Everything in it — its teachings as well as the language in which those teachings were couched — is from God. This is an orthodox belief, and though Islam has in the course of time given rise to various schools of thought, there has been no difference of opinion in the Islamic world as to the origin and significance of the Quran. And there is yet another beauty in the Book. Everything that concerns doctrine, tenets, laws, morals, ethics — in short, every essential for Muslim life and conduct — has been laid down in the Holy Book in terms most unequivocal. The statements are always consistent in meaning; they never admit of two interpretations, and their rendering has been one and the same with every shade of opinion. In ancient religions ritualistic piety has always bulked large. In Hinduism, as in Judaism, it is part and parcel of the whole faith; Christianity, though it denuded itself of Jewish ceremonialism, nevertheless fell a hopeless victim to Pagan ritual. The Romish and the High Church section of the Church of England present a very good illustration of this. But Islam has almost entirely dispensed with such piety, if piety it can honestly be called. No doubt there is a shade of formalism to be found in some of our institutions, but it is essential — as, for example, in the case of the gestures that we observe while in the act of prayer. These indicate certain conditions of mind, and hence are a necessity. I will speak later on as to the why and wherefore of these things; for the present I would remark that they cannot admit of any change or allow of any reformation. Everything of this nature has been ordained for us by the Quran; and if all the injunctions in the Quran are from God, as we do most firmly believe, we cannot take exception to any of the so called formalities in our prayers. A Muslim is bound to observe them in letter as well as in spirit — letter and spirit in such a case being identical. Had the Quran ordered us to say our prayers, without prescribing the manner in which we are to, say them, we could have adopted any form that local or other considerations might recommend. But the Quran has not only enjoined for us the saying of the prayer, but it also prescribes the forms which we are to adopt in praying. How can a Muslim follow one part of the Quran and disregard another? The Sacred Book has in the clearest terms deprecated such a course. If we stand1 in our prayers, or bow down and recline,2 or kneel,3 or prostrate4 ourselves by placing our hands on the earth, we do all these things because we have been ordered to do them in the Quran. We have been left no discretion in the matter. Some of us may not appreciate the reason for it, but they still have to follow the Quran implicitly so long as they remain in the ranks of the faithful. If the various observances in Muslim prayer had been derived from India, Egypt, or some other Muslim land, there would have been reason for a preacher of Islam in the other regions of the world bringing the formal aspect of prayer into conformity with the ways of such new lands; but as it is, he carries the Quran to his new converts, and must see that its injunctions are obeyed to the very letter. The same applies to the institutions of fasting and pilgrimage. If we abstain from eating, drinking, and other things during a certain month for a certain period every day, we are only following the Quran. Some of the Muslims, obsessed with the new ideas, come with the old, old plea of “the spirit”; they say that they follow the spirit and need not observe the letter — a meaningless phrase — a thing belied by their own conduct in other walks of life, since they cannot dispense with form; whatever they do, their actions assume a certain shape. The so-called “spirit” also needs some form of expression that will give shape to its thoughts and actions. So if this be indispensable, and they must adopt certain forms in the expression of this very “spirit”, which they say they observe, then why should they give precedence to their own judgement on what it has pleased God to prescribe for us? We have to adopt certain postures while at our devotions, and why should Muslims be ruled by individual opinion, if the words of God are very clear on the point? In fact, these friends unfortunately are too prone to be remiss in certain religious duties, and the word “spirit” is used as a sort of subterfuge for covering their own deficiencies. On the other hand, our new brethren-in-Faith have accepted the Quran as the final word from God, for indeed the Book leaves no subject untouched. They have got the Quran in their own hands, and the Sacred Book lays down its every principle and tenet very clearly. It prescribes in most unambiguous language everything that constitutes religion. Why then go to Mr. A. or Mr. B. for enlightenment and not to the Quran? As I have remarked, all our feelings need expression, whether in word or in gesture. In most cases these go together — the movement of the lips is accompanied by the movements of the eyes, the hands, and sometimes of the feet. If the tongue speaks, our hands move with it to intensify our meaning. Eyes are sometimes more eloquent than are articulated sounds. Just as these modes of indication are necessary on every plane of life, so they are essential in matters of devotion. For instance, the Hindus stand or sit with legs crossed in their worship; Christians on such occasions stand, or kneel with eyes closed; the Jews recline, bow down, and observe different genuflexions; while the Chinese, the Tibetans, and some of the Hindus place their foreheads on the earth in expression of obeisance. These forms were in vogue before Islam, and belong to the times when insurmountable natural barriers were separating one class of humanity from another. The Divine Dispensation at that time had blessed every nation with a religion which taught the special modes of devotion suitable for its own requirements. All these religions were fundamentally the same; they brought the same teachings, and the only difference lay in the ceremonial portions of the faith. But the ancient conditions changed. All natural or artificial barriers had become removed, and the people of various nations and races were brought together. There was then a need for a universal religion, and Islam came to bring the different units of humanity under one flag. A universal form of prayer was needed, and in this is food for thought for such persons as, with genuine and honest motives, meditate the desirability of introducing changes into the formalism of Islam. They should not forget that Islam was meant for all those nations which were already in possession of their own form of worship. If Islam had come only, let us say for example, for Rome, we should follow the Roman ways perhaps even in our form of prayer. But a Muslim is a citizen of the whole world. His religion is cosmopolitan in character, and so should be his prayer. It should not prescribe a form unknown to one set of people while familiar to another. The Quran is a Book for the whole human race, and so it prescribes a form of prayer that may cover all the manifestations of pre-Islamic devotion and reduce them to one harmonious whole. Nations, as I said before, were accustomed to stand, to sit, to recline, to bow down, to prostrate themselves, and to raise their hands in their respective acts of worship. It was for Islam to prescribe a form of prayer that might comprehend all these various forms, which had, indeed, been the ways prescribed for different nations by the Lord of hosts in olden days; and the same Lord has now thought fit to string, as it were, all these separate beads into one Divine Rosary. Again, would it not prejudicially affect the uniformity of Islam if the Muslims in the West adopted one form of prayer while those in the East followed another course? It would be a most undesirable scene if the Occidental and the Oriental Muslims met together to worship one God and used two forms. The Quranic words are too clear to allow of any difference of opinion. Even if had not been so, the Holy Prophet translated and interpreted every Quranic injunction through his actions. His sacred life is in itself the best commentary on the Quran. It is not only to the Arabic lexicon that we look for an interpretation of the meanings of the Holy Quran, but to the actual life of the Prophet itself, which has explained every Quranic teaching — a fact to which the Quran has also referred.5 It says that Muhammad not only brings the message of the Lord to the people, but also that his actions constitute its best exposition. In illustration I may here refer to one place in the Muslim prayer where we adopt a sitting posture. “Qu‘ud” is the Arabic word in the text used for this, and “Qa‘ada” is the root of that word and means “sitting” in the particular manner which we Muslims adopt in our prayer. Furthermore, the Prophet himself showed us how we should sit when praying. Other ways of sitting during prayer were not unknown to the Prophet. He was aware that the Christians knelt upon their knees, and he also knew that the old Persians sat cross-legged when worshipping God, yet to explain the true meaning of the Quranic words he placed himself in the posture which we adopt. The word primarily means sitting, but the Arabic lexicon and the action of the Prophet together specify the posture of sitting that we have to make use of in prayer. I appreciate the fact that certain postures in our prayer create some inconvenience to the newcomers under the flag of Islam; but conversion to a new order is generally not without hardship, let alone inconvenience. Conversion means destruction and construction — the giving up of a certain belief and certain modes of thought and action, and the adoption of new ones instead. Conversion causes a great revolution, a mental conflict — sharp and ruthless, but honesty of conviction makes but little of all the inconveniences which that conviction entails. The inconvenience in fact, is of no consequence, in comparison with the opposition which a new convert has to face when he gives up his old faith. To people in England I do not think that Islam presents much difficulty. They are the only religiously disposed people in the West. They belong to a religion that is full of conventionalities and rituals. Nay, their very life is shackled with forms and ceremonies. Whether at the table or in the toilet, whether in society or in church, every step of English life is burdened with conventions. Islam is, to such, a true emancipation. Can they reasonably complain of our postures in our prayers when they have to do a hundred and one similar things in their daily lives? It is true that it would be easier for them to worship the Lord in the forms to which they have been used to; but if one has to respect old habits as such, then the next demand would be for a rasher of bacon and strong drink on the Muslim table. In short, Islam has done away with every sort of vain ceremonialism, retaining only such things as are indispensable. There is yet another aspect of the question: I mean the mystic side of our prayer. We have to bring mind and body in unison with each other when at our devotions. We have to adopt such a posture as may give the mind that undisturbed scope for meditation which is, in fact, the very core of prayer. Habit plays a great part here. Some, concentrate their minds when standing, others when sitting or in a particular posture, or when prostrate. Different temperaments favour different positions of the body. I experience a sort of aloofness from the world when I prostrate myself. Psychology and physiology recommend kneeling as the most suitable position for deep meditation. If this is the condition of the human mind, how can we stick to one form? Our prayer should comprehend all the postures that are favourable for concentration of mind in different classes of people, and Islam has done this very thing. I could say a great deal more to substantiate my contentions; but in concluding this aspect of the subject I would simply observe — and especially to my Muslim brethren — that Islam in the technical sense means implicit submission to the teachings of the Quran. And if the Quran is so clear on a subject, how can we think otherwise?